Last week, Karl Fenner had his instrument smashed at the airport in Atlanta, Georgia, just after he won an audition to play in the ASO. 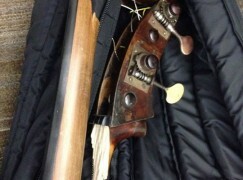 Now we hear from Milton Masciadri, a teacher at the University of Georgia, that his doublebass has suffered the same horrible fate. Milton’s bass is, we hear, a beautiful Tessore. Someone needs to get a grip at the TSA. Meantime, don’t fly an instrument to Atlanta. Or, if it’s that valuable, don’t fly it at all. Perhaps the bass player should walk on water? Or, perhaps baggage handlers/TSA people could do their job better. If someone undoes a belt or buckle in luggage, logic/intelligence/training tells us it needs to be rebuckled. It’s not a complicated idea. How do you propose getting from New York to London? Or Berlin to Tokyo? This is a world in which flight is essential to business as well as other travel. It is high time the airlines addressed this situation, collectively. Any given airline may face instruments only a few times a week, but out together, there must be dozens if not hundreds of flights a month. Musicians are professional working people (or high-performance students under terrific competition stress). They should not have to endure white-knuckle conditions every time they travel to a job, an audition or a competition. The airlines’ cavalier attitude to this situation is becoming intolerable. where, in the second half of this brilliant monologue the player falls over his own instrument. And of course British music lovers remember the incident at the Cheltenham Festival in 1992 where an angry double bass player severely damaged his instrument by lifting it and having it land on the head of the conductor in a heated argument over tempos. TSA inspection takes place at departure, not at arrival or change-of-planes. One lesson here is to avoid departing from ATL — and perhaps any other large airport in the States, where TSA inspectors are working under the pressure of large numbers. A second possible lesson is to watch during TSA’s inspection of the instrument. This may not be feasible, unfortunately, in all airports, but it might help to ask anyway. SoCal Dan has it exactly right. I’ve been lucky enough not to have any experiences with the TSA that were actually bad, but my experience at small airports (in South Carolina, in my case) has been very good. The agents have been professional, courteous, and sometimes even friendly. Seems like, in these cases at ATL, the bassists might have been better off driving the two or three hours and flying out of Greenville/Spartanburg, Columbia, or Birmingham. somebody go to CNN or similar and get some coverage of this. Once it hits national TV you get action. It is absolutely outrageous.